corn muffins, pancakes, and waffles in it so far! It came with a scoop which was great to put the batter in with! I also was happy that it came with a brush to clean it off with when I was done, which works great! The 5-in-1 Tasty Baker is so fun! Also check out the Mickey 5-in-1 and the Princess 5-in-1! Thanks Pop Art Toaster for the great products! 7 kid friendly molds in one cooking plate. 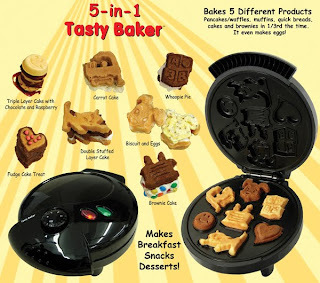 Size of Tasty Baker: 4.5Hx8.5Wx10D"
to give away one 5-in-1 Tasty Baker! OOO...my waffle iron is dying! How fun! oh my gosh...I have been wanting one of these since last October! I might encourage all those children who won't eat. Fun shapes might distract them and make food more appealing! My waffle iron died a couple of years ago. This would be a great replacement! That is SO CUTE!! i love it!!!!!!!!!!!!!!!!!!!!!! I am a follower of your blog! This thing looks pretty cool. Follow your book blog too! Shauna you are so fun and cute! I am in! rss subscriber. I'd love to win this. how fun!! count me in! I follow you on twitter (etirv)! How cute! And fun! Maybe if my breakfast was smiling at me, I might eat it more often. I also follow your book giveaway blog. How cute this would be for my kidos! I desperately need a waffle iron. i love the cuteness!!! Follow this awesome blog here! oh!!! I have wanted one of these but the only one I saw was a Disney one...and I'm not a fan of characters-endorsments...yes I know I'm weird! So I'd love this one!!!! I follow your blog and I love making waffles. i voted for you. would love this waffle iron! Those are fun shapes! My kids would love them! WOW THIS IS A GREAT PRODUCT AND FUN FOR THE KIDS. AND ALSO A FOLLOWER, THANK FOR THE CHANCE TO WIN THIS COOL PRODUCT. Sweet, that would be so fun for breakfast! Shauna, thanks for your kind birthday wishes! How fun this would be to win! voted for your blog again today.